Quilon or Kollam is fairly important for the State's trade and commerce and is the center of the country's cashew trading and processing industry. It is also an important hub for the State's marine products industry, with the port of Neendakara being the center for travelers and ice plants. For all its natural gifts of wide rivers, dominant hills and forest, lakes and plains, there is the throb of a vibrant industrial activity that combines with equanimity the wonders of the modern age with the traces of a bygone era. Quilon which is a veritable Kerala in miniature is gifted as it is with Kerala's very representative features - sea, lakes, plains, mountains, rivers, streams, backwaters, forest, vast green fields and tropical crop of every variety both food crop and cash crop. 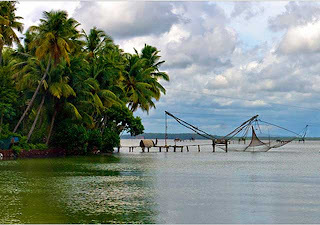 Location: Kollam is situated about 71 km. north of Thiruvananthapuram and is linked by rail, road and backwater transport. The town edges with the famous Astamudi Lake. There are many important temples in and around Kollam. The Kottukal Rock Cut Cave Temple; around 10 kms from Kollam is an ideal example of rock cut cave temple. 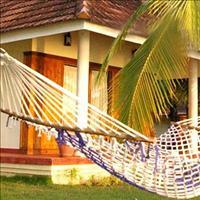 Mayyanad 10 km south of Kollam, is noted for its Shrines and temples. The most important temple is the one at Unayanalloor, dedicated to Lord Subramaniyam. It is believed to be consecrated by the great saint Shri Shankaracharya of Kaladi. Besides the temples, there are three churches and a mosque. The Oachira temple is the most unsual temple without any shrine or any idol, but the presiding deity of Parabrahmam is worshipped by one and all. The Achencoil Temple is situated amidst dense forests and idol of the local deity Lord Sastha has been here for the past 2000 years and even more. The other important temples near Kollam are The Bhagavathy temple (Anchal), the Aryankavu, the Sasthamkotta, and the Kulathupuzha temples. 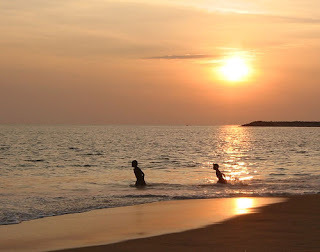 Located 71 Km to the north of Thiruvanathapuram, Kollam is another coastal district of Kerala. The district, which is the center of the country's cashew trading and processing industry, also has some interesting historic remnants and a number of temples built in traditional ornate architectural style.One of the oldest ports on the Malabar Coast, Kollam was once the port of international spice trade. 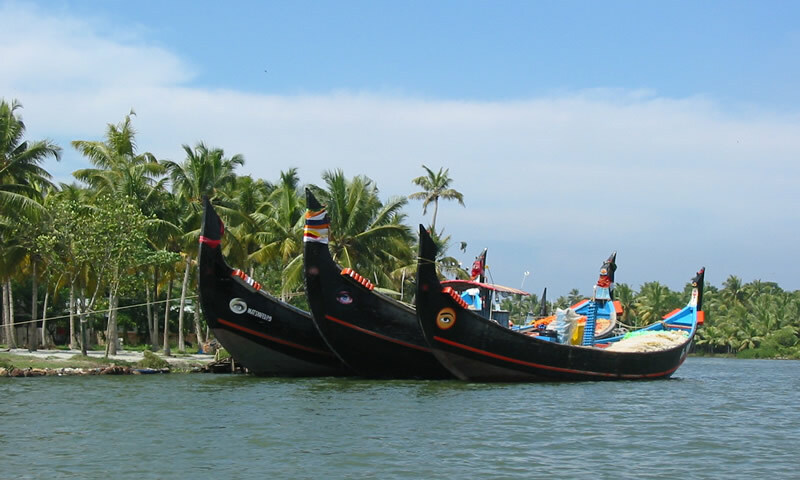 30% of this historic town is covered by renowned Ashtamudi Lake, making it the gateway to the magnificent backwaters of Kerala.The eight-hour trip between Kollam and Alappuzha is the longest backwater cruise in Kerala. Established in 1984, the Shendurney Wildlife Sanctuary situated on either side of the Shendurney River is the only one in the Kollam district. The sanctuary covers a total area of 250 sq km and is acclaimed the world over for its bio-diversity. The Parappar dam has been built across the Shendurney River and serves the purpose of irrigation in Kollam and Pathanamthitta districts. The lake covers a total area of 13.72 sq km. The mean temperature during summer is 35 degree centigrade and during winters it around 16 degree centigrade, with the annual rainfall is approximately 3200 mm. The terrain here is rugged with gentle to steep slopes ranging 90m to 1550m. The Aquaserene Resort is a 3 star property with 28 villas, part of the Tulip Star Hotels chain which presently has luxury class hotels in major cities in India. The chain is headed by the Ex-Chairmen of the Taj Group of Hotels Dr. Ajith B Kerkar and other seasoned professional’s from the hospitality industry. A Luxury hotel with 95 rooms, located on the beach offering panoramic view of the Arabian Sea from every room till its horizon. The hotel is an ideal host to a holiday maker as well as corporates for their meetings, conventions at a destination which is untouched by many.... providing seven wonder views of the sea, beach, park, city, greenery harbour and backwaters. 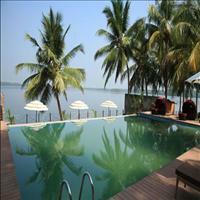 Nila Palace is a 3-star deluxe hotel, situated at Kollam, near Thenmala. It is the first and the only Hotel in South India to be certified as ISO 9001: 2000 and HACCP IS/15000: 1998 together. We have 21 well-appointed rooms, which include 01 Royal Suite, 02 Club Suites, 02 Honeymoon Suites, 12 Deluxe Rooms and 04 Standard Rooms. We have 4 Banquet halls. Reservation Check In Check Out Rooms No of Persons We have well-equipped residential conference facilities to accommodate 25 to 600 people. Our service includes 12-hour Room Service, Business Center, Laundry, Doctor on Call, Currency Exchange, Safe Deposit Lockers, Direct Dialing, Internet Connectivity in each room, acceptance of all credit cards, check out 24 hours.